Today's smartphones, iPhones, iPods, MP3 music players and other hand-held electronic devices are truly wonders of miniaturization. Their slick, shiny cases are styled to please but at a price paid in imperfect ergonomics. In other words, slippery good looks can lead to dropped calls if you get our gist. 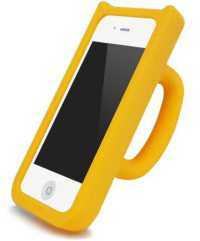 iPhone owners need get a grip... and the Mug Case from Strapya Taobao has got one you can handle! Designed to ape the tried and tested coffee mug, the Mug Case looks like the aftermath of an altercation over bitter brew served at the Samurai Deli. 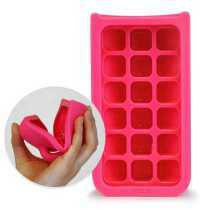 Save the portion of the mug that includes the handle, make a mold, and cast it in silicone plastic... add one iPhone model 4 or 4S and you're in business! The Mug Case comes in your choice of six colors: white, lime green, coral pink, turquoise blue, grape, and buttercup yellow. Slip your iPhone into the case and note the pre-perforated access ports: one for an earbud jack on top, another for a charging connector underneath. The handle comes in handy as a de facto cable reel for earbud or headphone cords. It also serves as a built-in stand, allowing you to prop up your iPhone in horizontal mode at angles of 40 or 70 degrees. 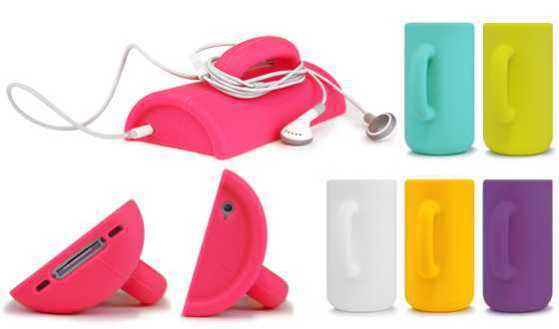 The Mug Case for iPhone is available online at the Strapya Taobao website priced from 262.20 yuan or around $41.50 each. UPDATE: You can get the iPhone Mug Case in the U.S. here at Amazon. CaffeinAll Delivers Caffeine You Can Sprinkle!